Well, we thank Allah during prayers when we read the Surat Al-Fatiha, right? And… ummm you know, when someone asks how we’re doing we automatically say, “I’m good thanks to Allah”, or “Alhamdulillah”. Hmm…what else? In Ramadan, we thank Allah A LOT! See? We don’t need a huge roasted turkey to remind us to be thankful to the Great Lord. 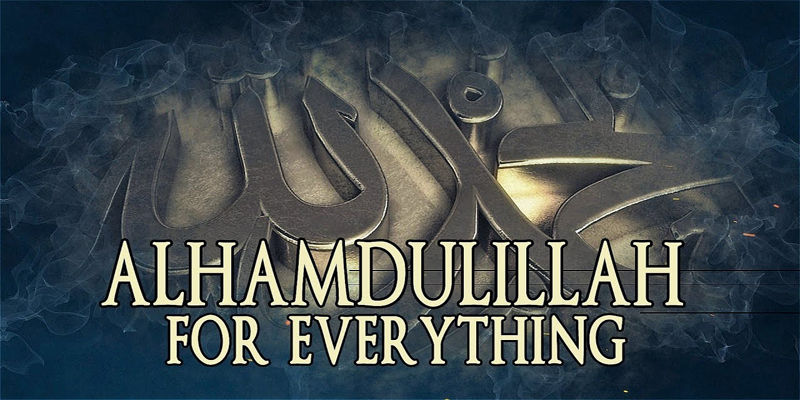 It’s in our system, it’s in our hearts and souls and minds to praise Allah every chance we get. Thankfulness is a lifestyle, a consuming feeling that Allah wants us to absorb to the fullest because He knows that’s the only way we will feel better. Anyone can say “thank you”, but it’s the emotion that accompanies the words that makes all the difference. So, in this article we will remind ourselves of a few points to make our gratefulness more meaningful and productive. Remember that Nothing is Really Ours! How many blessings do we take for granted?! The ability to see, hear, walk and talk effortlessly are all things we need to be thankful for every day. Renewing the appreciation helps us look at life differently. Imagine being surprised you still have your sight intact every time you wake up! Now apply that concept to everything else like your health, money, family, etc., and you’ll realize nothing is really yours. It was all given to you and you alone. Making a choice to have a grateful attitude interrupts our anxiety and gives us a huge sense of power. But if you’re not thankful for what you already have, what makes you think Allah would be prompted to give you more? Most of us are not really big on the words. It would help if there were practical ways of showing gratitude to Allah, and who is better than the Prophet(pbuh) himself to be our guide? Who Do You Thank First? Most of us have had loved ones get extremely sick, and have went through the panic attacks of calling doctors and running to the nearest ERs with no shoes. We’ve paced the waiting rooms and pleaded with nurses for more information, and put all our faith in legendary surgeons known for their high success rates. And when we held our loved ones again in our arms, we cried tears of joy and said “Thank God you’re okay!” But, did we really feel the appreciation in our hearts, or did we somehow attribute the miracles to the doctors and the medication? When you put ALL your faith and trust in Allah, He will never let you down. Being grateful to Allah increases the love in your heart, and makes it reflect on everyone around you. That doesn’t mean we don’t thank people, too. We must remember that Allah uses us as tools to help one another. There’s a middle ground between giving people all the credit and giving them nothing at all. Appreciation is the feeling people seek most. It creates a beautiful type of love that shrouds our good deeds and makes us want to help more and work harder to ease each other’s pain. You need more clues, don’t you? Try showing your thankfulness to others with little gifts. Prophet Muhammad(pbuh) explained on many occasions that exchanging presents brings about genuine love between people. We can’t help but give credit to ourselves, and that’s okay, as long as we don’t forget that it’s all Allah’s command after all. So the next time you’re a bit smug about an achievement, or find yourself condescendingly giving charity to a poor person, remember that it’s not your money you’re giving away, and it’s not your smartness alone that made you ace that test. Modesty and humility lead to pure gratefulness to Allah and that is the essence of wisdom. Perfecting such perception gives you a rare kind of knowledge the world is more than thirsty for today. Thank Him For Thanking Him! Isn’t that another blessing that needs a whole lot of gratefulness? Thank You Allah for letting us remember to thank You, and thank You again for reminding us to thank You for remembering to thank You. Islamic scholars explain that it’s when you’re totally baffled on how to show your gratitude to the Supreme Lord that you reach true and genuine enlightenment. A good example of struggling to show appreciation for your blessings is by sharing it! Giving charity makes both the giver and the receiver happy, and leaves us with double the amount of joy when we realize we have the power to change someone’s life for the better. It makes sense that Allah gives more to the people who are busy thanking Him: be it more wealth, better health, wisdom or success. The root of joy is gratefulness, and it’s a psychologically proven fact that you can rewire your brain to be happy by simply recalling three things you’re grateful for every day. “Yay! Let’s do that! I’ll go first!” my daughter said. “I’m grateful for hot meals in this freezing winter. I’m grateful my brother didn’t act up today, and I’m grateful for my mommy’s warm hugs! Thank you Allah.” My daughter smiled before closing her eyes to sleep. Please share with us what you are most thankful for and how you make it a habit to be thankful every day!